DETROIT – There’s no one Petr Mrazek would rather have between the pipes than Petr Mrazek. Mrazek, who signed a three-year entry-level contract with Detroit in October 2011, was 3-3 with one shutout at the 2012 World Junior Championship, earning a 2.49 goals against average and 0.928 save percentage, which included a 52-save effort in a 5-2 win over the USA. “During that World Juniors, nobody talked about the Czech Republic team,” Fischer said. “We had a young defense, nobody talked about the forwards. Everybody talked about Petr Mrazek. He put so much pressure on his performance to dominate the tournament – which he ended up doing – and by doing that, he took all the pressure off our team. 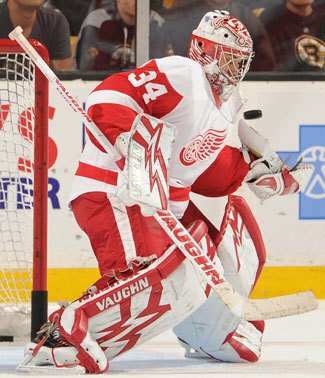 Mrazek joined the Grand Rapids Griffins for the 2012-13 season and posted a 23-16-2 record with one shutout in 42 games. The goaltender also got his first taste of the NHL that year, earning a 1-1 record with a 2.09 goals against average and .922 save percentage in two appearances with the Red Wings. Mrazek was in net for all 24 of the Griffins’ AHL playoff games that spring, compiling a 15-9 record with four shutouts to help Grand Rapids win the Calder Cup championship. Mrazek was named to the AHL Second All-Star Team last season, finishing second in the AHL in goals against average (2.10) and third in save percentage (.924) through 32 regular-season games. The 22-year-old earned a 22-9-1 record in his second season with the Griffins, while also seeing action in nine games with Detroit. Mrazek earned a 2-4-0 record with the Red Wings, with a 1.74 GAA and a .927 save percentage. His wins were shutouts at Edmonton (Nov. 2) and at St. Louis (Apr. 13).